Summer officially arrived (with a record-breaking heat wave here in California! ), which means it’s BBQ-season time! 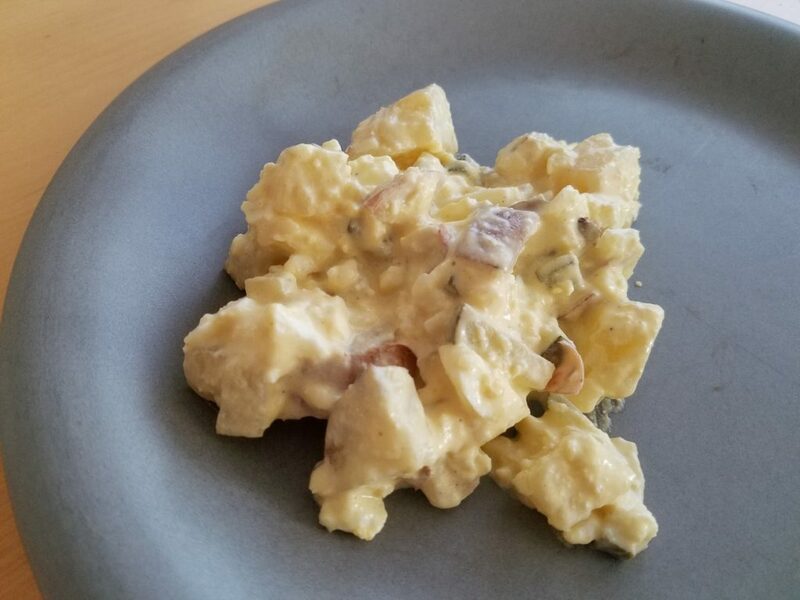 Whenever we have a BBQ, I like to make my mom’s (slightly altered) potato salad as a side dish. This was a summer staple for my family when I was growing up, and I was only happy to adopt it as an adult (thanks mom!). 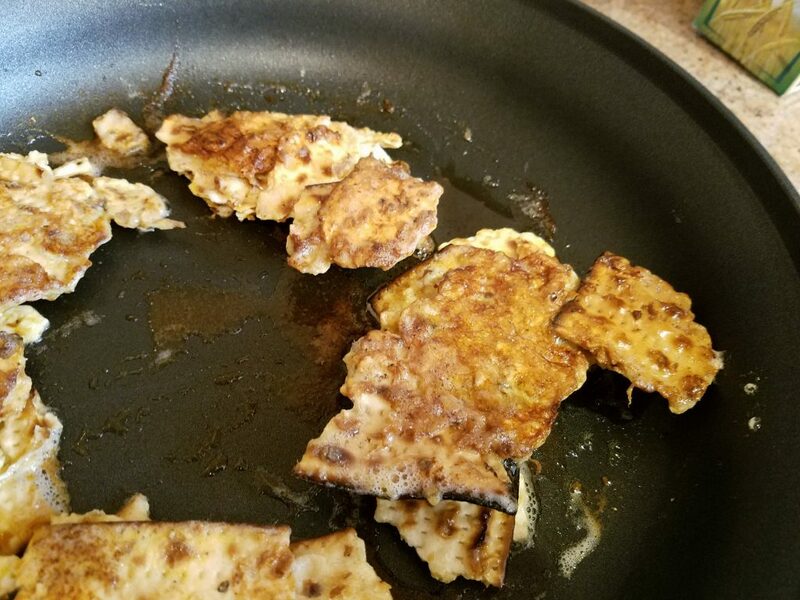 Over the years I received so many compliments on this dish, and so many friends have asked for the recipe, that I thought I will share it with you here. 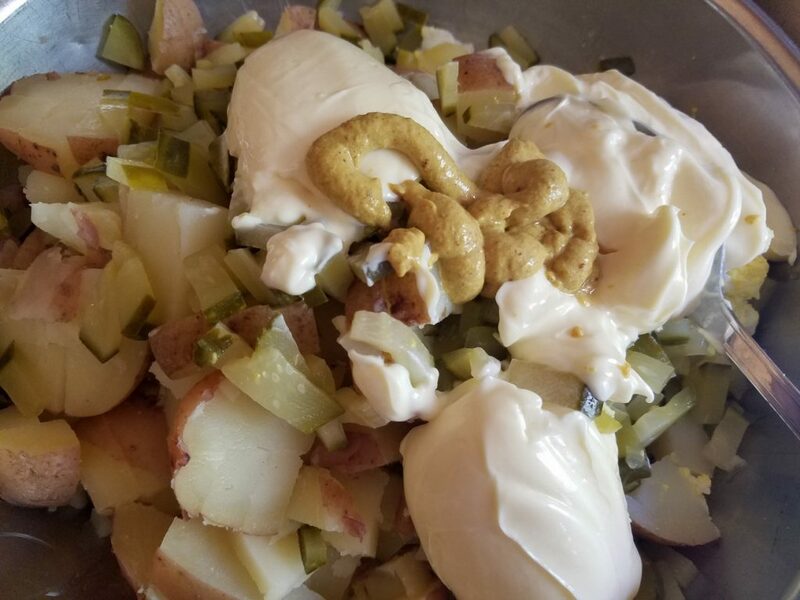 Make sure to try this potato salad next time you have a BBQ, or with any other meal, for that matter. It’s a great dish to share with friends, too! Cook the potatoes until soft (but not until they fall apart!). I cook them with the skin, as by the time they are ready all the germs are long dead. The skin is actually good for you, and adds lots of fiber! 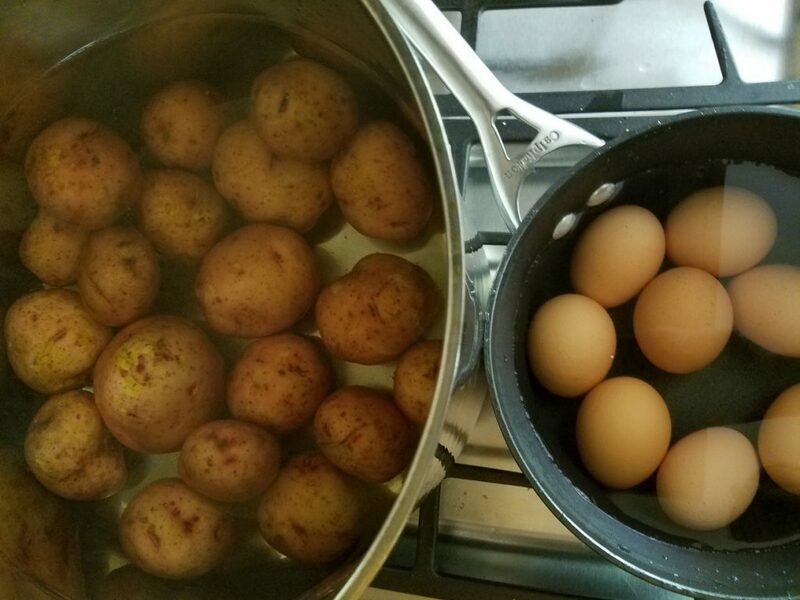 At the same time, boil the eggs until they are hard boiled. 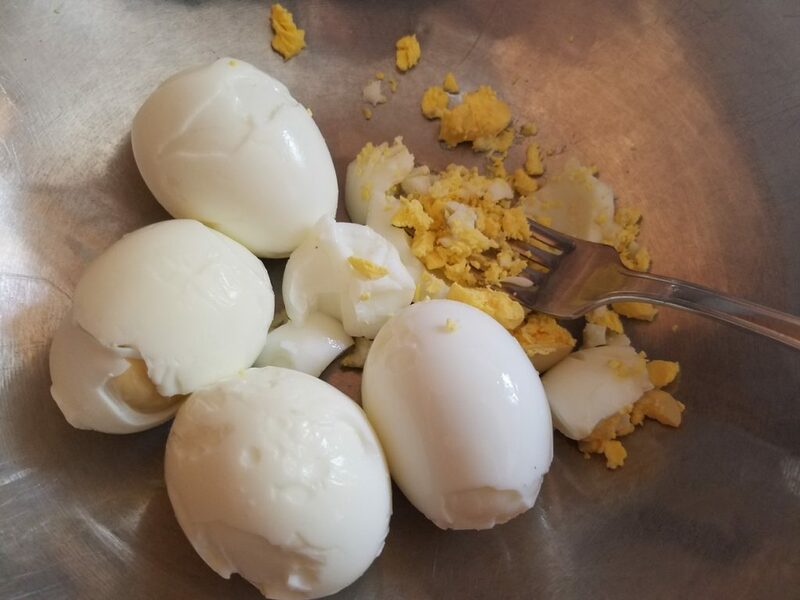 Peel the eggs and squish them in a bowl. 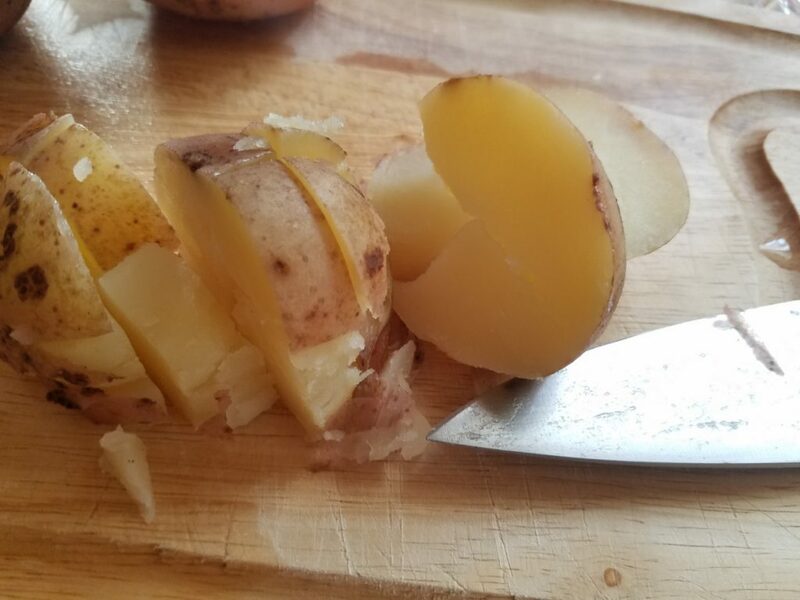 Cut the potatoes into small cube, and add to the bowl. 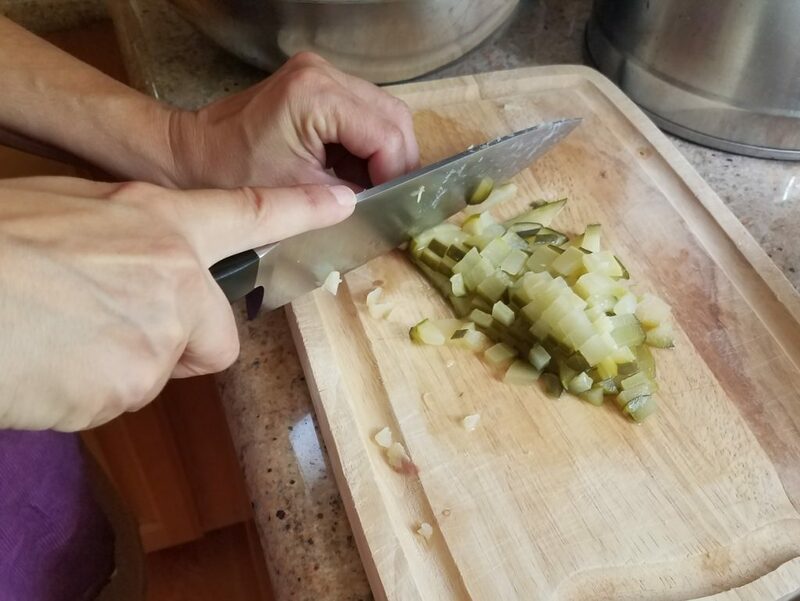 Cut the pickles into cubes, and add them, too. (Save the liquids to the end). Add a few tablespoons of mayonnaise, to taste. Finally, (and that’s my personal little tweak, which makes a big difference!) add a little mustard for an additional pop of flavor. Mix everything together and taste. Adjust salt, pepper, mayo and mustard as needed. If the salad feels too dry, add some of the liquid remaining in the pickle jar. 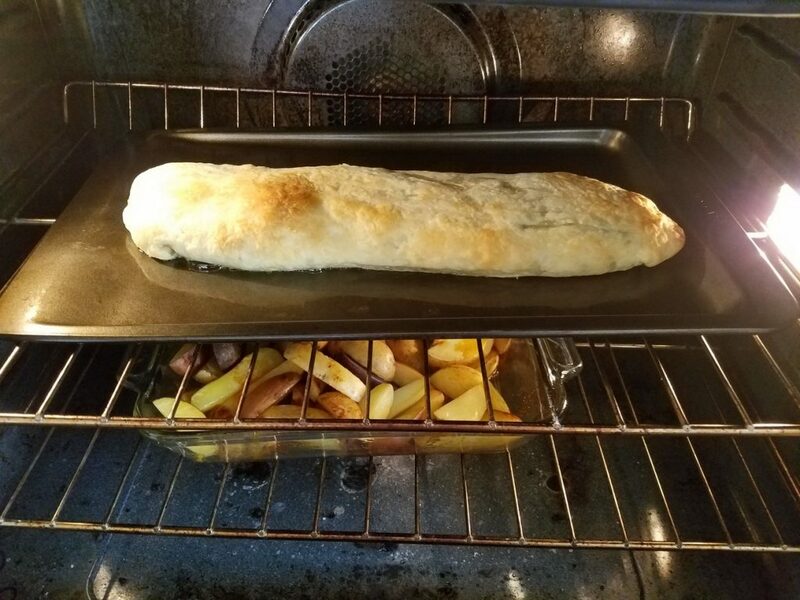 This can be eaten while the potatoes are still warm, or after refrigeration. 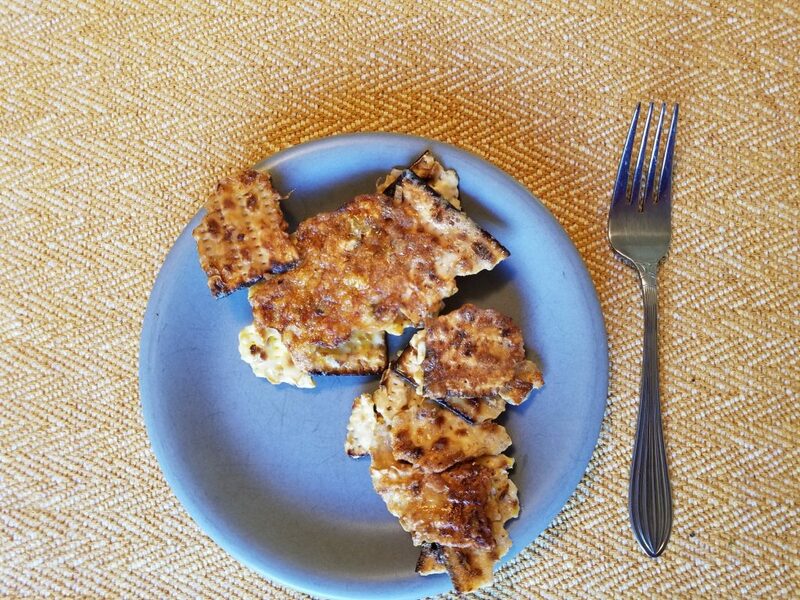 Leftovers can be refrigerated for several days, and still taste really good! Enjoy your summer and happy BBQing!! 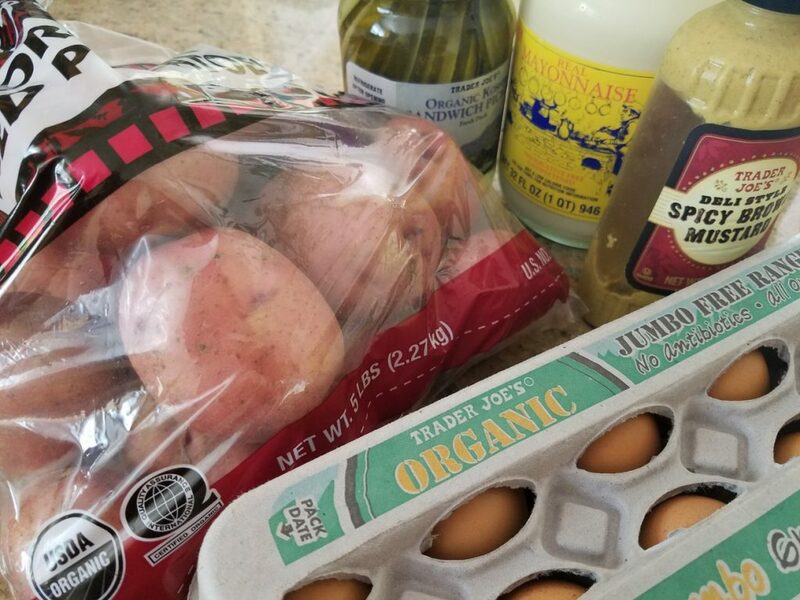 In Need of a Quick Dinner? 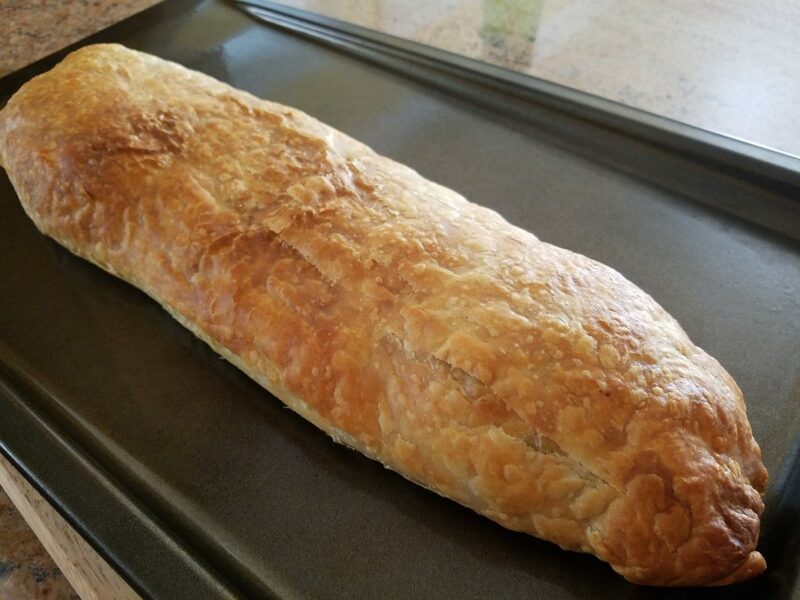 Try a Spinach and Puff Pastry Roll! We all have these days (weeks, sometimes!) when things just get really busy. We run around all day, doing the things we need to do, and the last thing we want to think about is dinner. 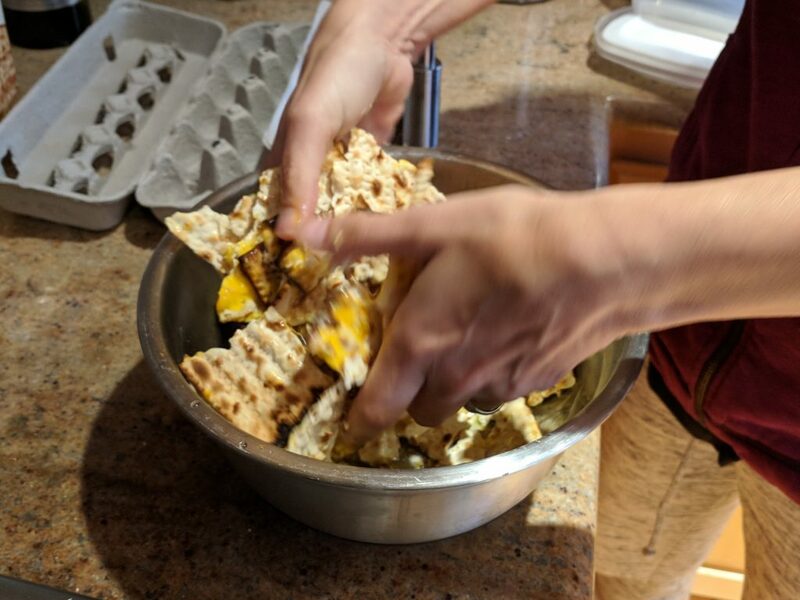 But then, inevitably, a few younglings return home from school absolutely famished, and there is no choice but to cook something with which to fill their bellies. 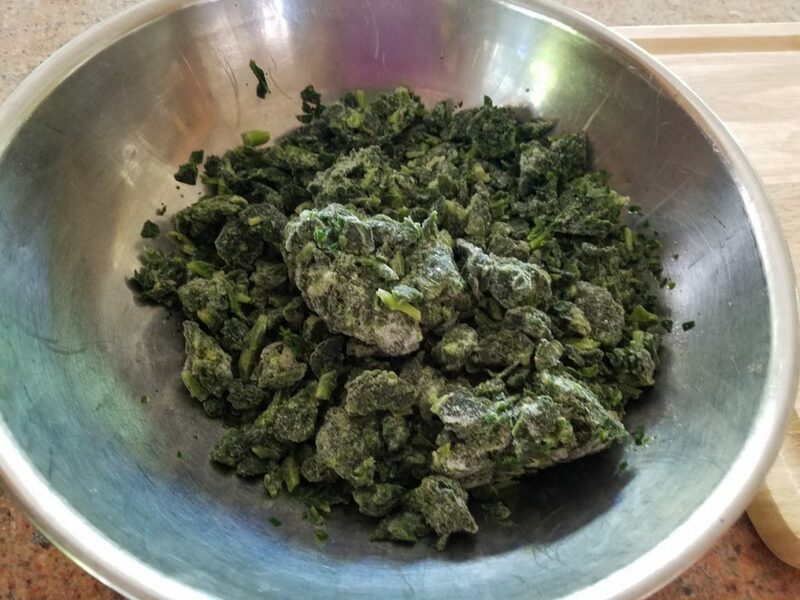 In the morning, take the frozen spinach and the puff pastry out of the freezer, put the spinach in a bowl and leave on the counter top to thaw. About an hour before dinner, fry the onion (if desired) and add it to the spinach. 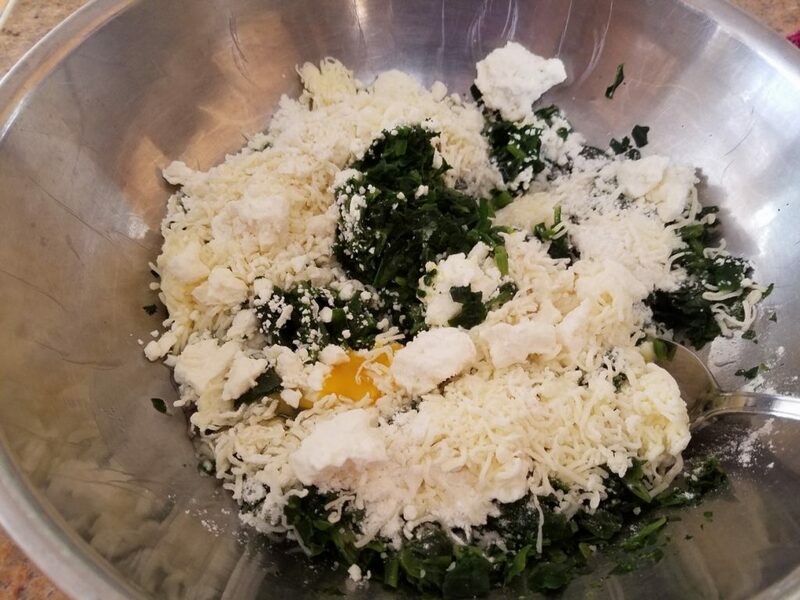 Add the feta, grated cheese, flour and egg and mix well. 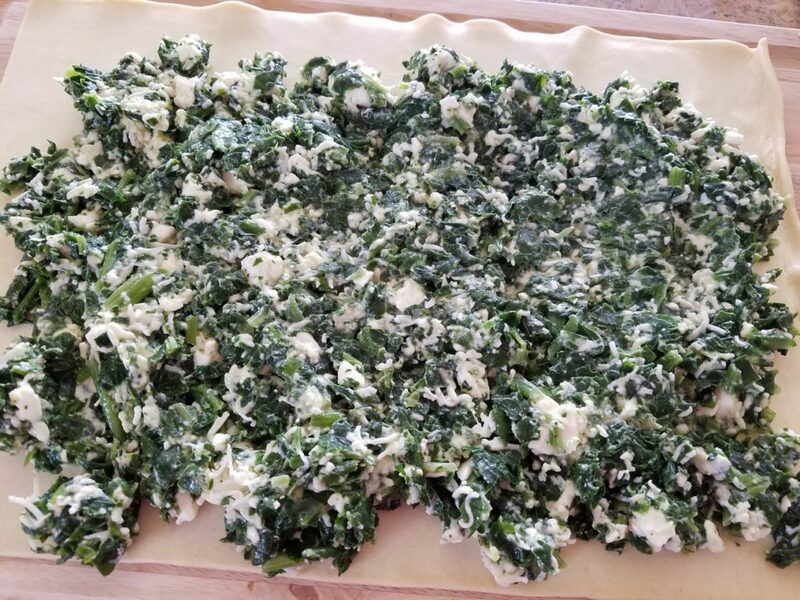 Flatten the puff pastry out, and spread the spinach mix on the pastry. Finally, roll it all together. Tighten the pastry’s edges (so that the filling does not spill out). Put on a baking sheet, punch a couple of holes, and toss in the oven. Bake at 400 degrees for about 40 minutes, or until brown. 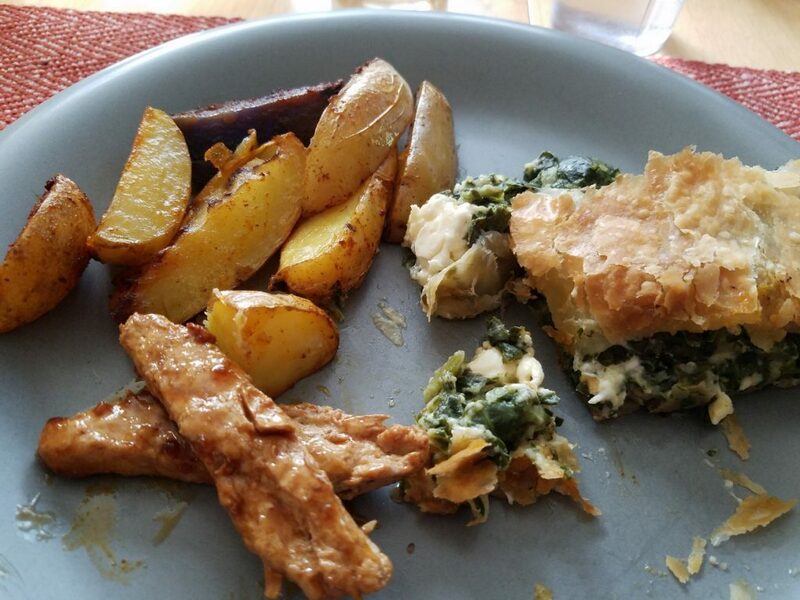 I usually combine the spinach roll with a potato dish, some protein and a salad. 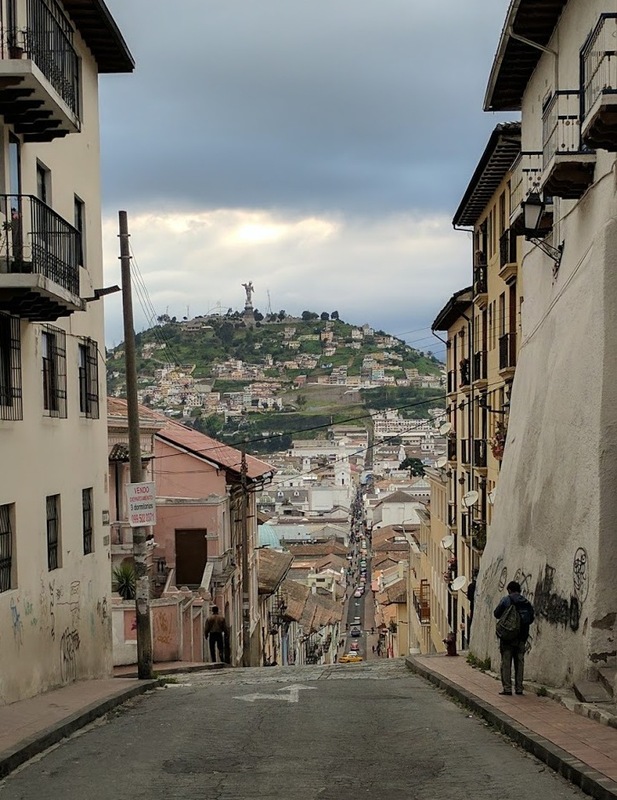 My family and I have been traveling a lot, but our trip to Ecuador this winter break was our first-ever foray to South America. The trip lasted only eleven days (not including travel), but felt a lot longer, being packed as it was with an array of experiences. 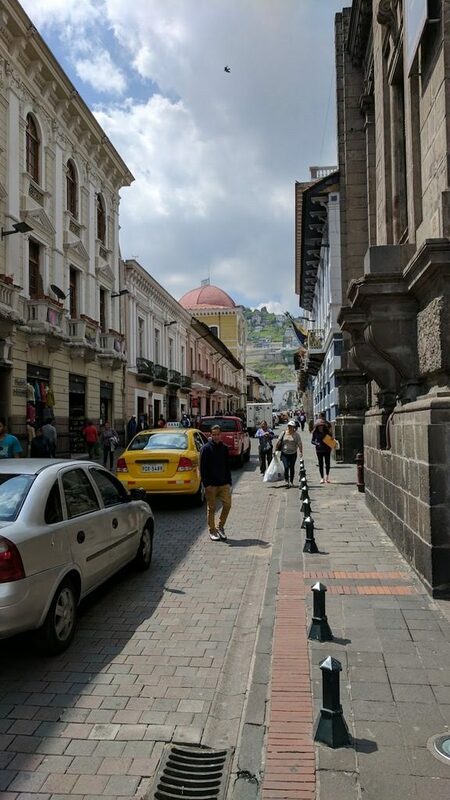 I find it impossible to summarize everything into one post, so today I will share only my impressions of Quito, the capital, which we visited on our first day, and to which we kept returning. 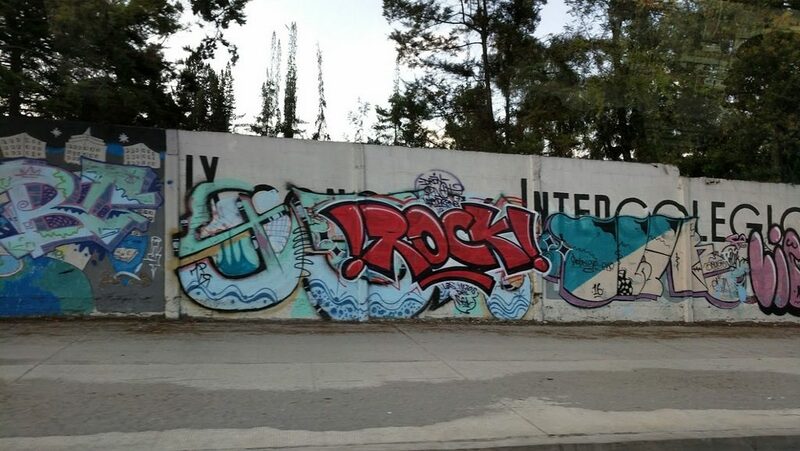 We landed in Quito in the wee hours of the night. I was surprised (and maybe just a little bit disappointed) to find a brand-new, top-notch modern airport. It looked just like any other airport anywhere else in the world. We took a cab to the old part of town, driving through dark, deserted and foggy roads. 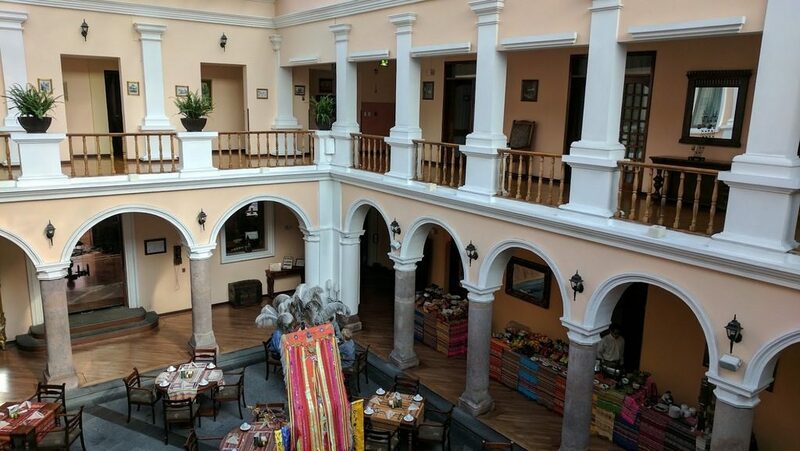 When we arrived at our hotel, utterly exhausted, we barely noticed our surroundings and went straight to bed. The kids were full of energy, however, and eager to explore. 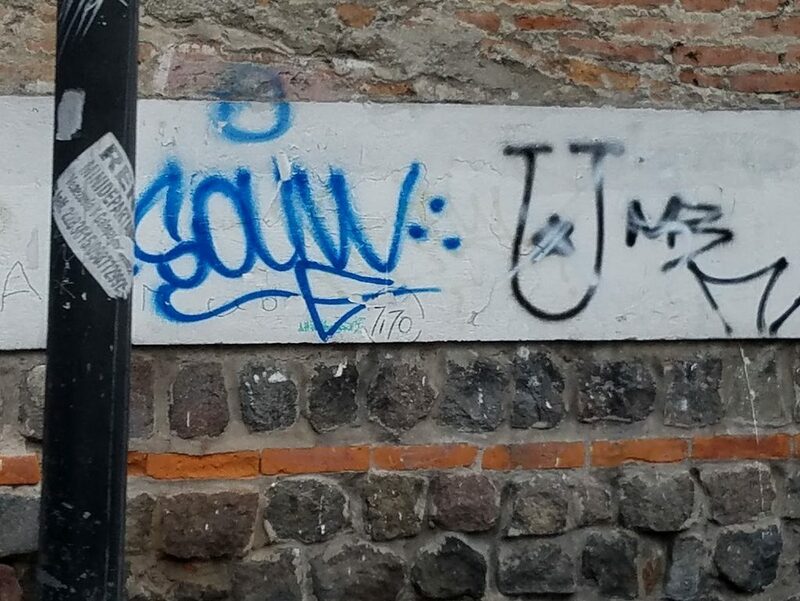 And so, I tore myself away from the Ecuadorian coffee and delicious croissants and ventured out. 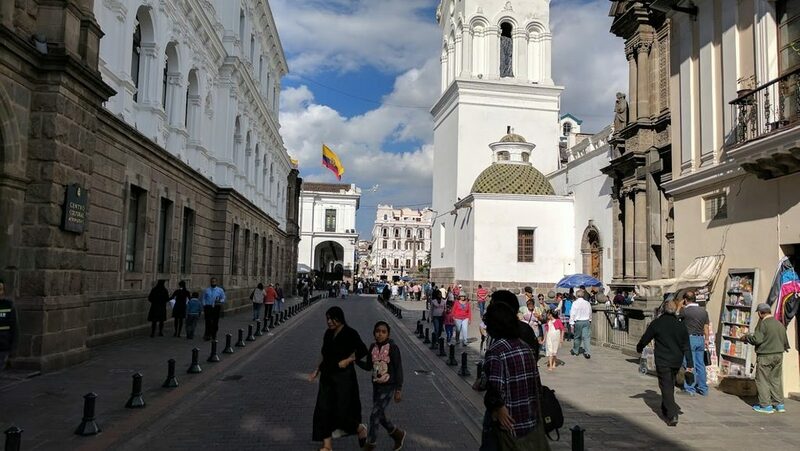 UNESCO chose the old city of Quito as one of the first World Heritage Sites. 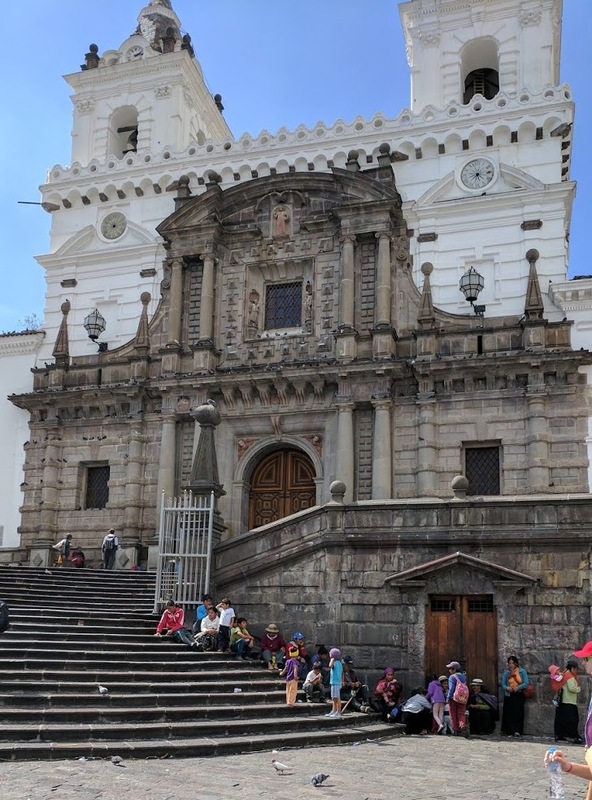 Today, people consider it to be the best preserved colonial city in the Americas. As a result, I had great expectations from the city. 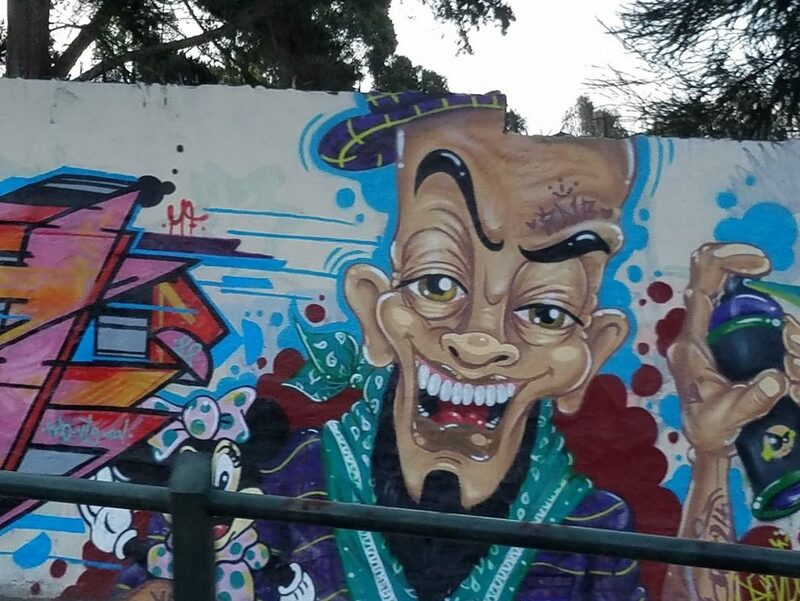 Initially, however, the city disappointed me. The narrow streets had old and pretty buildings on both sides, but these consisted of mostly high walls interrupted by small doors and windows. Even early in the morning cars and people already packed the streets. 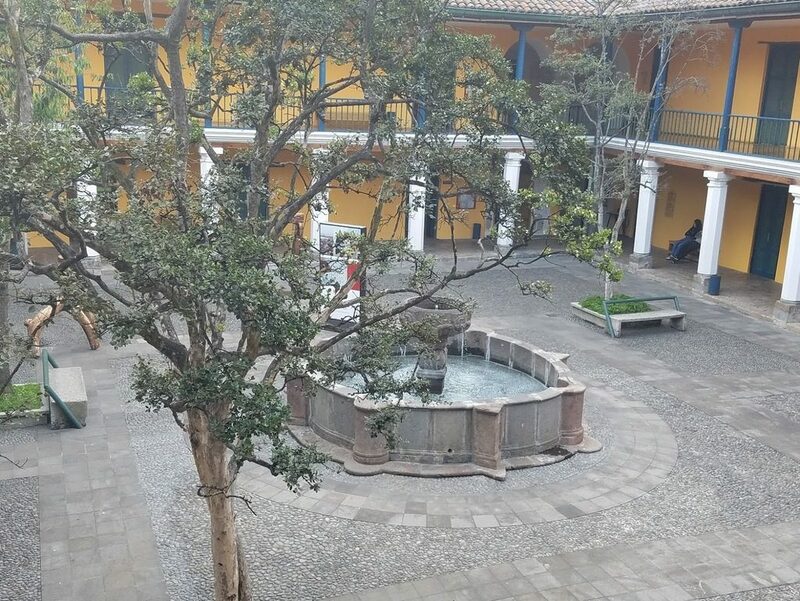 Only once we started visiting some of the numerous churches and museums did I finally understand the city’s secret: the non-distinct, high walls and small doors hide spectacular inner-courtyards and former palaces. Much of the beauty of this city, it turned out, like so much else in life, lies within. 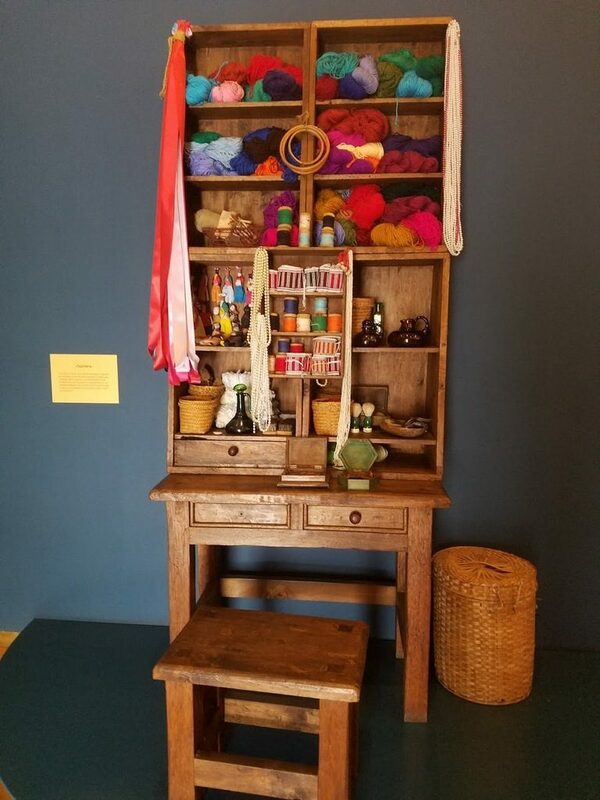 There, we first learned about the complex relations local people have historically had with textiles. 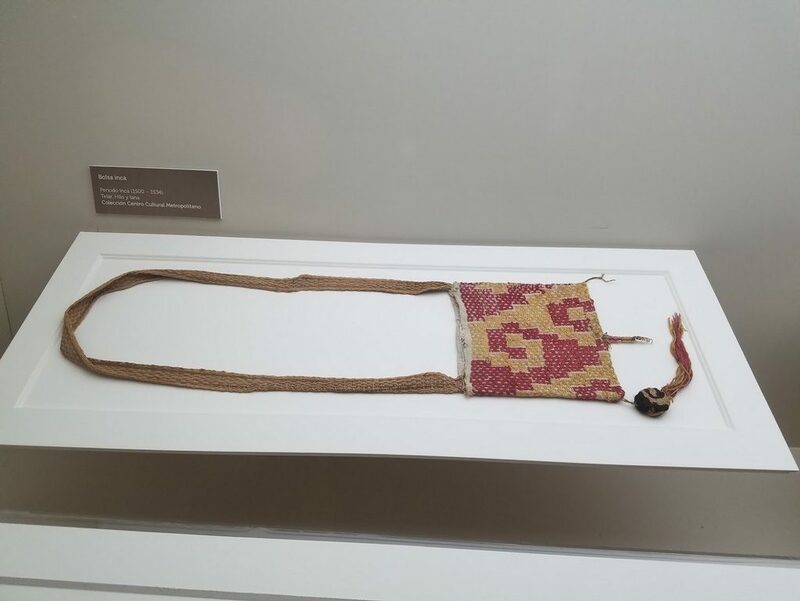 The indigenous people, it turned out, were good weavers before the Inca and Spanish conquests. The conquerors, however, forced them into a harsh, cruel weaving-servitude. Thus, the brutality of slavery tinted the art of weaving in people’s minds. 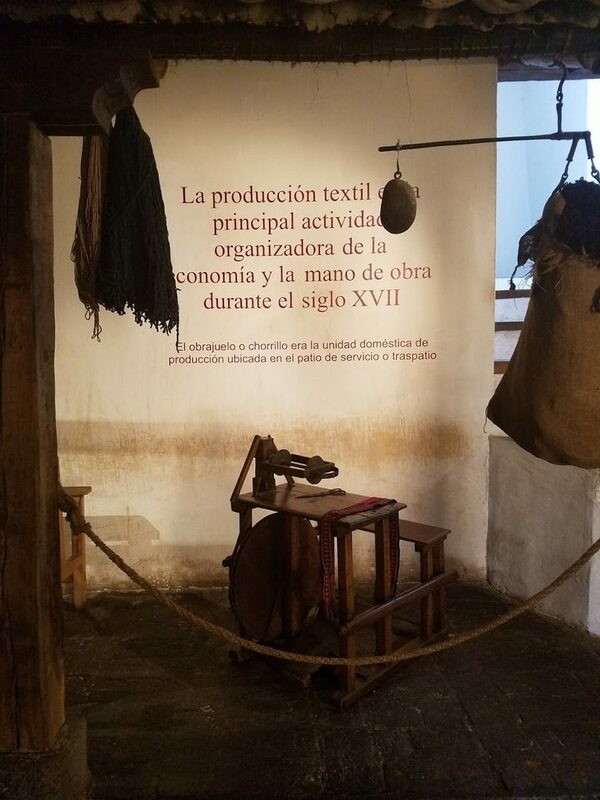 And in the house of Maria Augusta Urrutia–a 19th-century home of a noblewoman now turned museum–I was even more thrilled (and a bit jealous) to find an entire sewing room. The room contained several sewing machines. It was also lavishly decorated (alas, picture-taking was forbidden). Fabric and yarn stores were spread all over Old Quito. They easily put the humble offering of such stores in my hometown to shame. I was very excited to see them, until I realized that most of their inventory came from China… Still, I took their presence to be an indication to the craftiness of the local population. 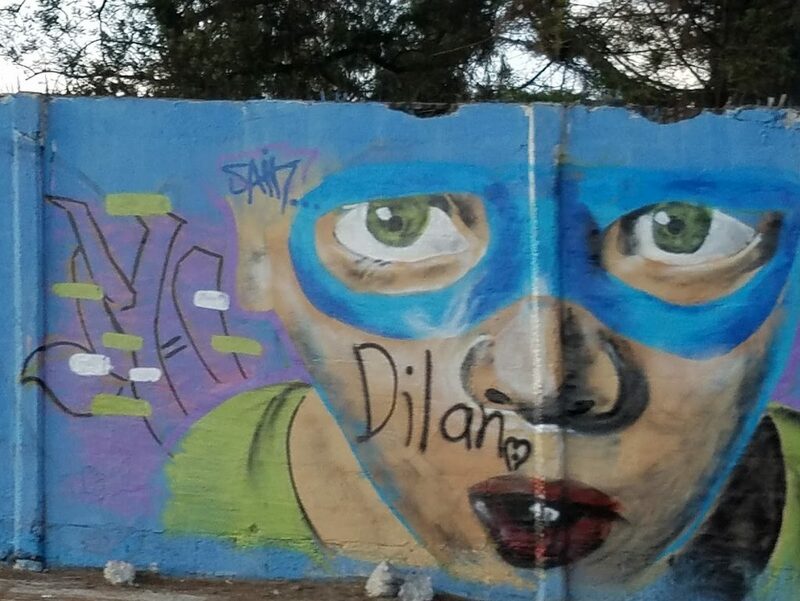 When we drove around, I was struck by the abundance of graffiti. 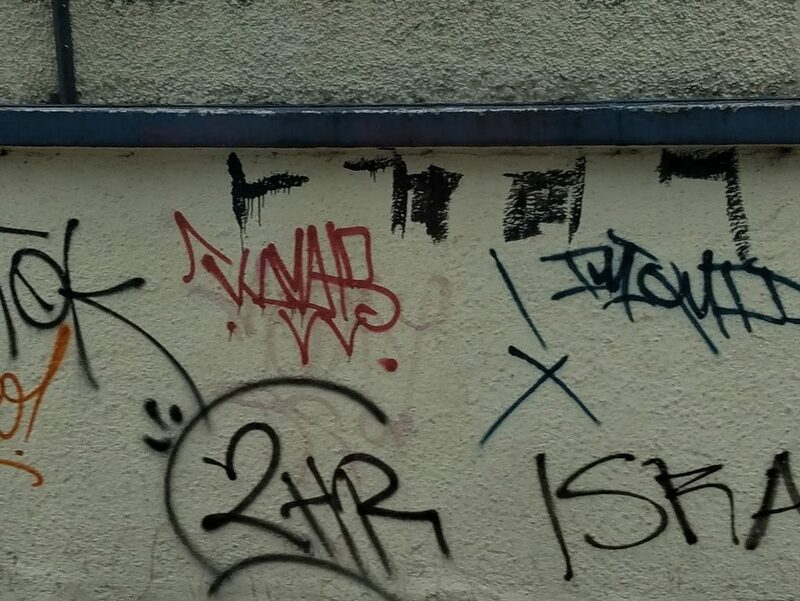 It seemed that every flat surface was an irresistible blank canvas for graffiti artists, calligraphers … or maybe just plain vandals? Another surprise were the hundreds of eucalyptus trees, which I did not expect in this part of the world. I later learned that people brought these trees to Ecuador to dry swamps. The eucalyptuses adapted so well, that they soon spread like wildfire, competing for resources with local flora. Apparently they are now a pest. 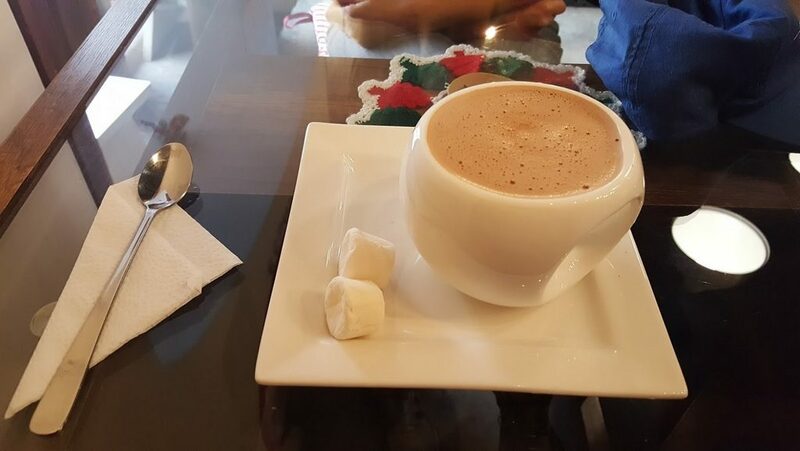 A fun Quito discovery was the Pacari chocolate store, where we enjoyed a decadent afternoon cup of hot chocolate, and loaded up on a variety of amazing Ecuadorian bars. 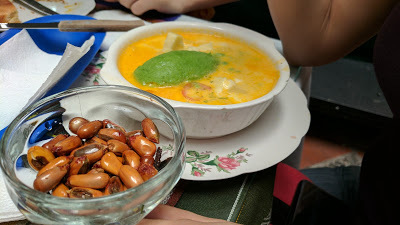 An additional gastronomical revelation was that of Locro de Papa, the tasty Ecuadorian potato soup. We later realized it tastes slightly different in every restaurant, but somehow always hit the spot. This is definitely a dish I plan to adopt and add to my family’s winter-soup rotation. Melt 1 tablespoon butter and 1 tablespoon vegetable oil in a heavy soup pot. Add the chopped onion and garlic, and optional aji amarillo paste. Sauté onions over low heat until soft. While the onions are cooking, peel the potatoes and cut into 1 inch cubes. Set aside. When the onions are soft and golden, add 1 cup of stock. Remove mixture to a blender and process until you have a smooth puree. Set aside. Add the potatoes to the soup pot along with 1 tablespoon butter. Sauté until potatoes are fragrant and just start to turn golden. Add onion liquid back to the pot with the potatoes, along with another cup of stock and 2 cups of water. 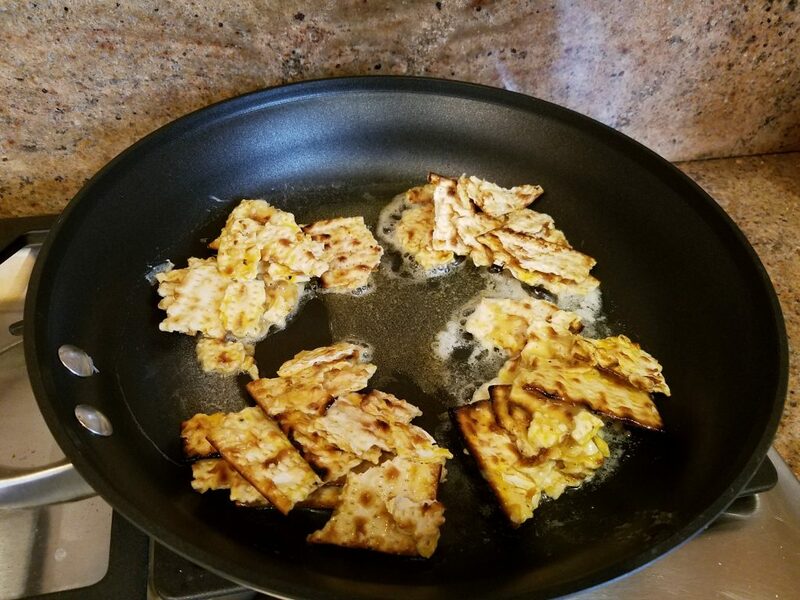 Bring liquid to a simmer, season with salt and pepper to taste, and cook potatoes until they are very tender, about 20-25 minutes. Mash the potatoes thoroughly in the pot with a potato masher. 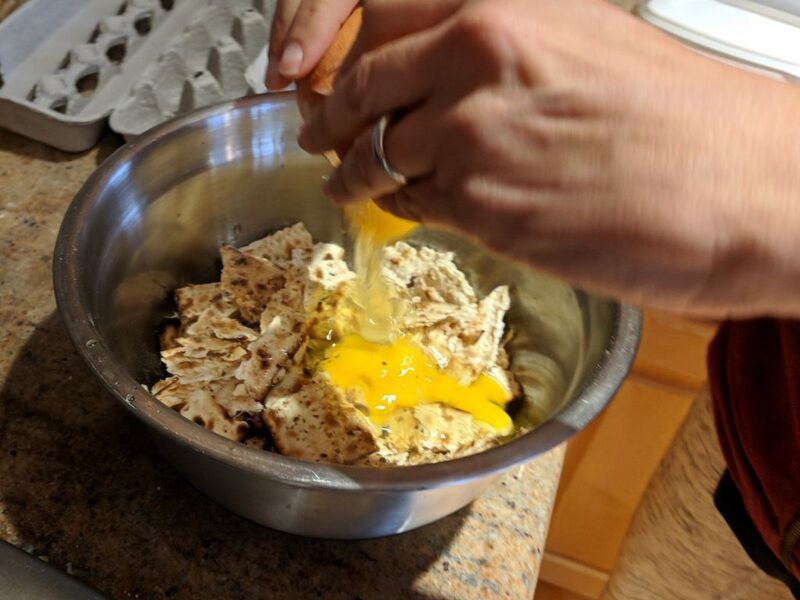 In a small bowl, whisk the egg together with the cream and milk. Whisk a cup of the hot soup mixture into the milk and cream, then add it all to the soup, whisking to blend. Whisk in the grated cheese until melted. Season soup with salt and pepper to taste. Serve soup hot, garnished with chopped avocado and crumbled queso fresco cheese. 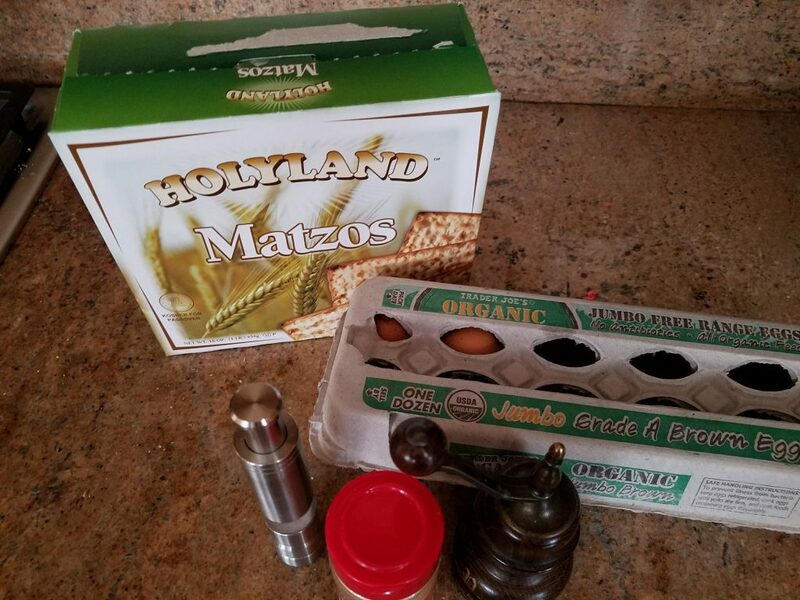 On Friday Bake a Challah! Today I decided to make time for challah baking, and it occurred to me that other people might like to try some, too. Mix all dry ingredients in a large bowl. 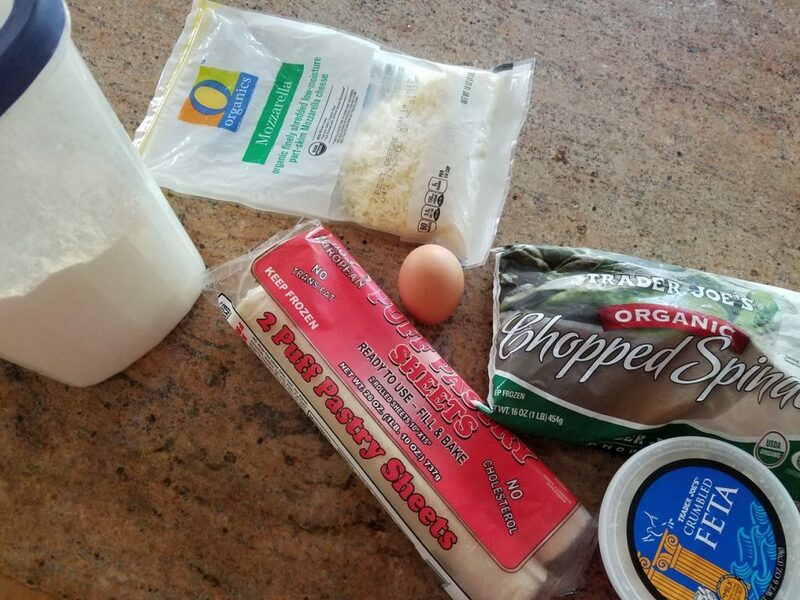 Add milk ,eggs and butter, and knead until you get a soft, non-sticky dough. Add milk if too dry, or flour if too wet, until you reach the right consistency. Let rise for two hours. Punch down, knead again, and shape into whatever shape you want. I often braid my challahs, but sometimes I make them round. Every now and then I let the kids shape them whichever way they want. We recently had an elephant, a snail and several Pokemons. Let rise again for another two hours. 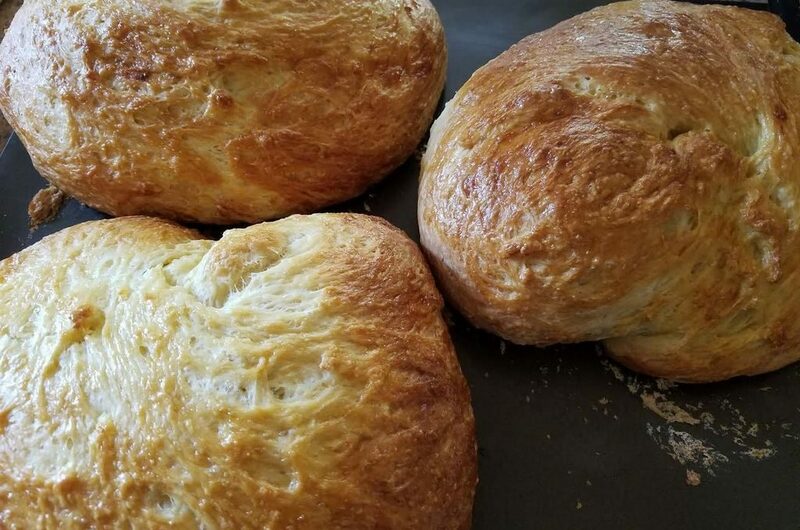 You can now bake your bread, but if you would like a nicer finish this is the time to mix an egg with a bit of water in a small bowl, and brush it over your loaves. You can then spread sesame seeds or poppy seeds for an even nicer, more finished look. Bake at 350 degrees for about 40 minutes, until your loaves are nice and brown. 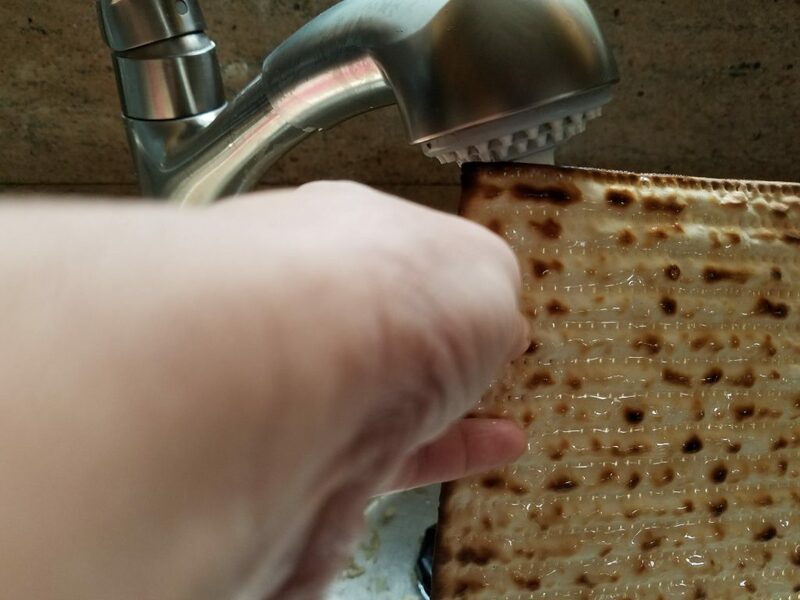 Tip: it’s really nice to grab a slice while the challah is still warm. 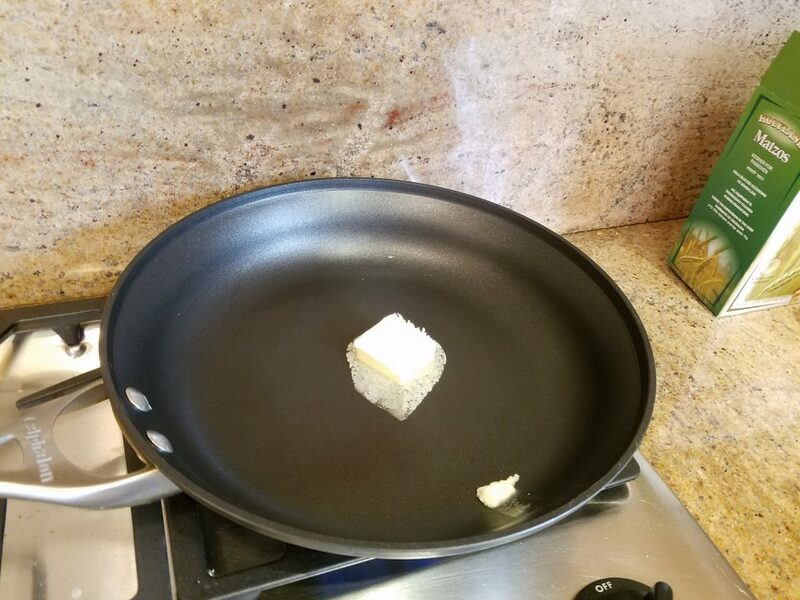 It’s especially tasty with melted butter on top!